The Experimental Unmanned Vehicle (XUV) Experiment is being conducted to examine the results of adding semi autonomous platforms to the Scout Platoon of the Army After Next. The Demo III Experimental Unmanned Vehicle (XUV) Program is designed to advance and demonstrate the technology required to develop future unmanned ground combat vehicles through three major thrusts: (1) concerted technology development; (2) modeling, simulation and experimentation; and (3) technology integration and evaluation with users. Demo III focuses on demonstration of technology that will enable the development of small, highly agile, unmanned vehicles capable of off-road, semi-autonomous operation at speeds of up to 32 km/hr during daylight and 16 km/hr at night by 4Q FY 2001. Demo III supports development of two emerging requirements at the U.S. Army Armor School for a robotic scout system and a robotic leader-follower system. Technologies for these systems are applicable to a wide array of Army programs. This program was transferred to the Army for funding, beginning in FY 2001. 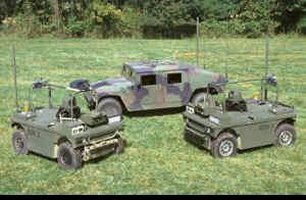 On January 29, 1998 Robotic Systems Technology*, Westminster, Md., was awarded a $4,700,000 increment as part of a $22,966,408 (total at completion of effort) cost-plus-fixed-fee contract for Experimental Unmanned Vehicle (XUV (III)) System Integration, part of the DEMO III Unmanned Ground Vehicle (UGV) Program to develop and demonstrate small, survivable unmanned ground vehicles capable of autonomous operation over rugged terrain as part of a mixed military force containing both manned and unmanned vehicles. This system integration effort will result in the development of autonomous vehicle technology, integration of that technology into a UGV, fabrication of four XUV and support of multiple demonstrations and/or Battle Lab Warfighting Experiments in coordination with Department of Defense elements. Work will be performed in Westminster, Md. (63.2%); McLean, Va. (30%); and Princeton, N.J. (6.8%), and is expected to be completed by June 30, 2002. Contract funds will not expire at the end of the current fiscal year. There were 30 bids solicited on Aug. 14, 1997, and three bids were received. The contracting activity is the U.S. Army Tank-automotive & Armaments Command, Warren, Mich. (DAAE07-98-C-L013). IN January 1999 the U.S. Army Research Laboratory, Aberdeen Proving Ground, MD awarded on a sole-source basis as a proprietary service follow-on of Phase I to Science and Technology Associates, Arlington VA, Phase II of the Survivability Study for XUV in accordance with the Statement of Work "Define and Evaluate Approaches to Enhance XUV Survivability". 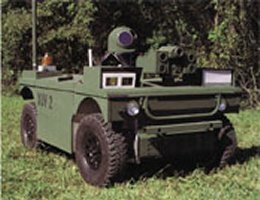 In June 2001 the National Institute of Standards and Technology (NIST) negotiated with General Dynamics Robotic Systems (GDRS) of Westminster, MD on a sole source basis under the authority of FAR Part 6.302-1 for the purchase of a Demo III Experimental Unmanned Vehicle (XUV). This vehicle is hydrostatic diesel, 4 wheel drive, 4 wheel steer, computer controlled using the NIST developed Real Time Control System using NML communications. The nature and pace of the technology development for the Demo III XUV did not permit drafting of definitive engineering descriptions and specifications. Based on NISTs specific requirements under the Demo III program, this XUV was identical to the XUVs previously manufactured for the program. NIST personnel worked with GDRS and the Army Research Labs in developing advanced controllers for the XUV. The anticipated delivery time for this requirement was 180 days after receipt of the order and the delivery shall be FOB Destination to Gaithersburg, Maryland. The Government anticipates awarding a firm-fixed price contract. NIST helped develop the mobility controller for the experimental UGVs used in the experiments. The Demo III XUV successfully navigated many kiloments of difficult off-road terrain with only high-level mission commands provided by an operator from a remote location. The Demo III team including the ARL, General Dynamics Robot Systems (GDRS), and NIST demonstrated an XUV for Secretary White on May 30, 2002. The XUV was controlled by an implementation of RCS that was co-developed by NIST and GDRS. The Army Research Lab's Demo III+ program has undertaken a series of experiments designed to assess the maturity of autonomous mobility technology for support of the Future Combat Systems (FCS) Block I Armed Robotic Vehicle (ARV) concepts. ARL has configured Demo III eXperimental Unmanned Vehicles to act as surrogate ARVs, incorporating the ability for operators to teleoperate the vehicle when the vehicle determines that it is unable to maneuver autonomously. ARL has developed an experimental plan designed to answer two key questions concerning the future fielding of FCS that were identified by AMSAA during a joint AMSAA/LSI workshop in mid-2002: (1) what is the level of maturity of currently available autonomous mobility technology, and (2) if the vehicle is unable to maneuver autonomously, what is the cognitive workload placed upon the operator when the vehicle is directly controlled by the operator? ARL has conducted experiments at two sites, thus representing two of the three key terrain types identified in the FCS Operational and Organizational (O&O) Plan. Those represented are rolling/arid (experiments conducted at Tooele Army Depot, UT in December, 2002), and rolling/vegetated (experiments conducted at Ft. Indiantown Gap, PA in January, 2003). ARL conducted a third set of experiments in urban terrain during late March/early April 2003. At Tooele, weather was generally cold, dry, and clear; at Ft. Indiantown Gap, weather was frigid, and for at least one day there was falling snow. 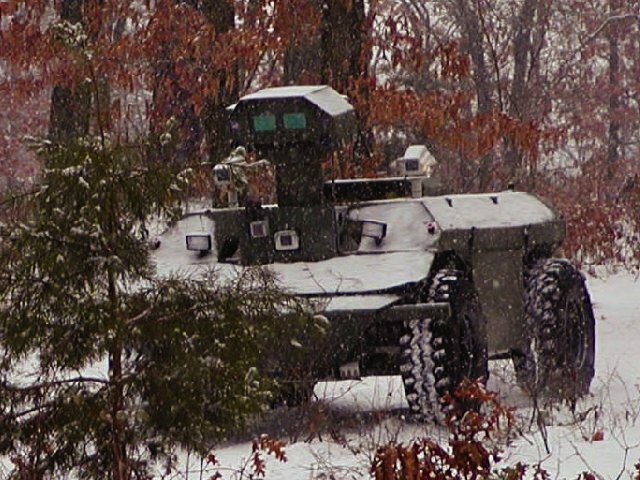 The XUVs proved to operate successfully regardless of weather conditions. To supplement the performance data, ground truth was obtained at each site after the conclusion of testing using high precision LADAR that was registered to the terrain through differential GPS (measurements conducted by the National Institute of Standards and Technology) together with vehicle trafficability measurements (conducted by TARDEC). At each site, ARL has assessed autonomous mobility performance over a range of values for six independent variables: (1) terrain type (arid-rolling, vegetated-rolling, urban); (2) operator/XUV team; (3) mission length (500m, 1000m, or 2000m); (4) line-of-sight/non-line-of-sight control mode; (5) maximum permissible UGV speed (3 meters per second and 10 meters per second - UGV speed is also regulated by terrain complexity), and (6) terrain difficulty/type. The testbed vehicles logged over 400km during experiments at the two sites, and interim test results indicate a high degree of mission success. At each site vehicles were able to maneuver autonomously for the vast majority of the distance covered. While it was found that teleoperation was generally slower than autonomous mobility (influenced by the fact that teleoperation was a fallback if the vehicle could no longer maneuver autonomously), intervention times were generally short. Observation of operator workload during periods of teleoperation (using standardized test procedures) indicated that trained technicians generally utilized only part of cognitive resources. Soldiers with only a few days training on the system registered slightly higher values. The XUV had a high mission completion rate. XUVs operated autonomously over a large portion of the distance covered. A significant percentage of operator interventions were caused by mechanical characteristics of the testbed platform, e.g., loss of traction on steep, sandy slopes. Teleoperation performance (time, distance, success rate) during a line-of-sight operation (when the operator was assisted by another member of the crew who had line-of-sight to the UGV analogous to a tank commander) did not differ from non-line-of-sight operation (when assistance from another crew member was not permitted). Teleoperation was observed with increasing frequency during longer missions. No significant differences between day and night operation of the XUV was observed. During night operations in more complex terrain, XUV speeds approached those observed for manned HMMWVs. Terrain complexity impacted XUV performance. A larger number of operator interventions were observed during experiments conducted at Ft. Indiantown Gap which possesses a more complex terrain (e.g., woods, creeks) than Tooele Army Depot. Speed achieved by the XUV was independent of mission length with regard to autonomous mobility. Small differences with regard to XUV/Team were observed during autonomous operation. Post-hoc analysis attributes these differences to the XUV. Variation of maximum permitted XUV speed negligibly impacted XUV performance. Over the course of 2002 the program temporally focused upon assessing autonomous mobility technology maturity in support of the Future Combat Systems Milestone B decision process. Under the concept proposed by the FCS Lead System Integrator (LSI), three classes of UGVs will be employed as part of Increment I: (1) a 5-6 ton Armed Robotic Vehicle (ARV); (2) the approximately 2 ton Multi-role Utility/Logistics Equipment (MULE) platform, and (3) the approximately 30 pound Soldier portable UGV (SUGV). While the SUGV is envisioned to be a teleoperated system, both the ARV and MULE are expected to be semi-autonomous platforms, employing teleoperation only as a backup mode of operation.